This experimental project shows how to build a simple and inexpensive WiFi packet analyzer (also known as a WiFi sniffer). The heart of this project is WiFi module of ESP32 which is able to work in a promiscusous mode. 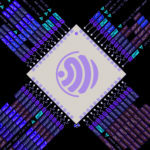 It means that this clever chip allows IEEE802.11 network packets capturing for further analyzing. Because WiFi module doesn’t implement automated channel switching, additional code has been added in the main loop that switch channels in 500ms intervals. Presented sniffer requires a callback function that will process all received promiscusous packets. Example callback function displays few basic information like packet type (control packet, management packet, etc. ), RSSI or MAC addresses. The full code using ESP-IDF is on GitHub, click here. This code is written in C and can be compiled using xtensa-esp32-elf-gcc. Don’t know how to start ? 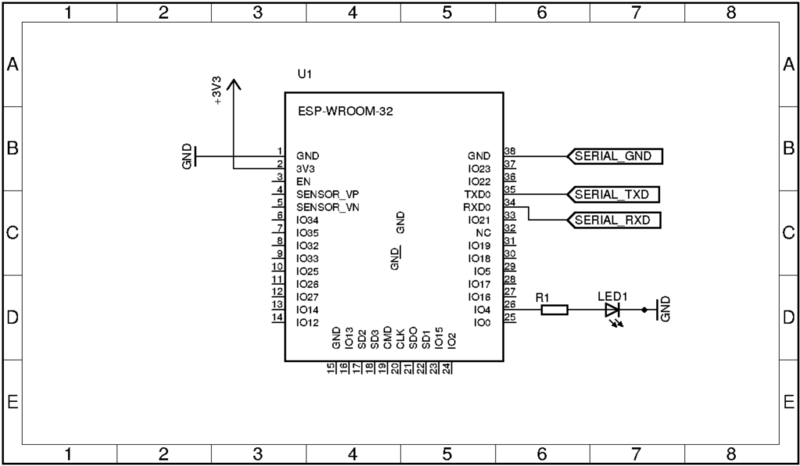 Please read about how to compile and upload program into ESP32. Very nice!!! How to compare MAC address of the friends or clients with the nearby MACs? Hi Lukasz, I know this is a couple years after the post but was hoping you still check comments. I’m currently looking into parts that can be used as a wifi/bluetooth packet sniffer. I know someone who used an ESP8266 for sniffing WiFi packets, but he said it didn’t work with newer cellular devices because it only supports modulation schemes up to MCS7. 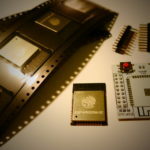 I assume the ESP32 is compatible with modern devices, but would like your input. I thought about using a CC2640+CC3100, but a fully integrated BLE+WiFi SOC would be ideal, especially since there is no existing host driver for interfacing the CC2640+CC3100. Any ideas? Hi Alec, I always recommend ESP32 for small packets sniffer but it also has some limitations like: sniffing one channel at a time or support only 2.4GHz band. I didn’t use CC2640+CC3100 chips but looks quite good. Probably on “clear” ARM it will be more challenging to create such packet sniffier than on ESP32. Anyway, if you’re planning to design something that will be a product / production ready then I would recommend to use dedicated/existing AP hardware (with for example OpenWRT) that supports 2.4/5 GHz and write some code (User space or Kernel space – using i.e. Netfilter hooks) to capture packets. I have two cell phones with wifi enabled and they don’t connected to any network. I know their MAC addresses so I expect to see them in the output results, but I don’t see them. Instead I see a lot of other MAC addresses that belong to Tp-Link, D-link and some other network vendors. I guess that all these addresses belong to routers or some other access points. Why could this happen? Why I don’t see mu devices but I see routers? Thanks. 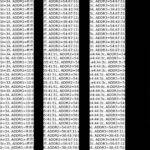 Hi Andrey, you can see AP MACs because they broadcast constantly WiFi beacon frames. Client devices which are not connected to any AP also can broadcast beacon requests while performing active scanning. It happens frequently (ones per X minutes or on demand) but it depends on client-side configuration. Try to dig some info about WiFi beacons. Please kindly give advice and directions for a beginner. Hi Paweł, generally – it should work but note that you can capture/decode packets only if your PV inverter produces not encrypted data. It would be easier to start with some packet analyzer (i.e. WireShark). Try to capture some packets and analyze the content before you dive into ESP32. It will give you information about payload structure. This information will be useful to create proper packet filter and payload parser. Good luck! I am trying to figure out what the “payload” returns? like how do you know what the types and values are for “wifi_ieee80211_mac_hdr_t”? What do you mean with? The structure “wifi_ieee80211_mac_hdr_t” reflects WLAN MAC Frame. Well, some of network/wifi libraries have closed sources but let the tip be that ESP-IDF has adopted a FreeBSD WiFi stack (et80211/ieee80211, http://www.unix.com/man-page/freebsd/9/NET80211). I would like to sniff “PROBE” packets. How to do it? 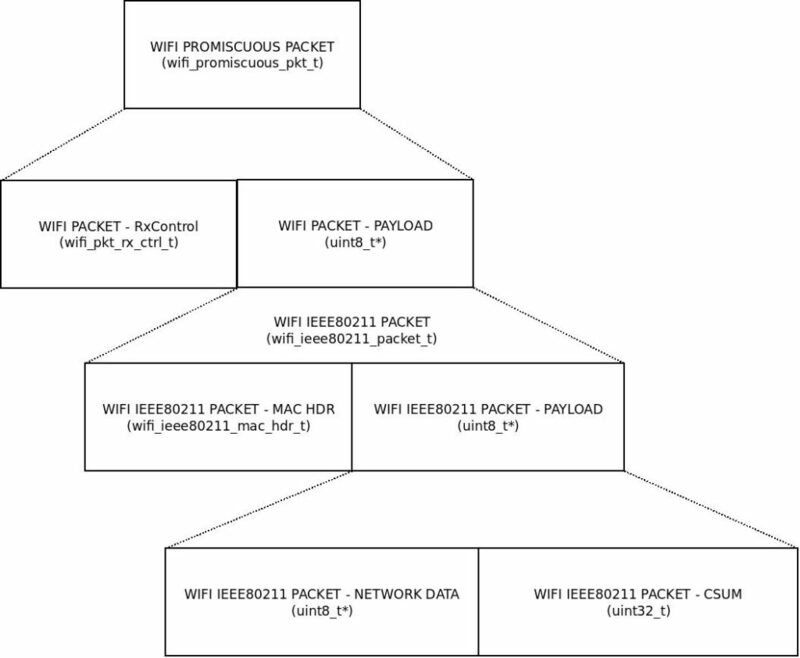 Is your wifi sniffer code able to detect AP_PROBEREQRECVED ? 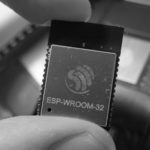 A list of STA devices around the ESP32 in AP mode. Hi, code has been updated. Hi, seems like all that issues with “undefinds” points to the same fact – switching to newest version of ESP-IDF. I’ll update the example code to support current version of ESP-IDF. …The format is slightly different, but still based off C, with a main loop and some initialization code. I should be able to port it, but I believe there is a missing library? Perhaps “freertos”? I am running the same problem like Defozo, but you do not explain how to solve it? is there an update to the .h files? I’m standing in the rain. When compiling with the Arduino IDE, the same problems are reported. Also with the answer from Lukasz, I do not know what have to be changed. Maybe Lukasz or Defozo is able to tell me, what has to be done to get it work. Thanks a lot in advance. I’m going to look at this code this weekend. 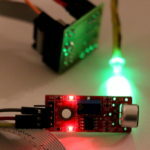 Łukasz, I know the Arduino IDE is a C++ compiler – do you know what I’d need to do to get started converting your program to Arduino IDE? I’m guessing I might need to add some .h files, and alter some function calls? I’d be happy if I can drop it straight in! Sarah, I’m quite sure you can do that using Arduino IDE and some Arduino libraries able to manage WiFi settings. 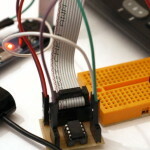 Arduino IDE uses low-level functions from ESP-IDF project which I’m using directly in my project. What you need is set WiFi mode to WIFI_MODE_NULL (no AP nor STATION), then turn WiFi into promiscusous mode (sniffing mode) and finally register custom handler able to process raw packets. Packet structure should be the same. Good luck! // initialize digital pin 13 as an output. and i needed the #include for this serial out..
in my last ESP8266 project i combined the promiscuous mode with station-Mode. the module is sniffing the channels..stop..and transfer this data via REST-API to a webServer..( and MS SQL DB ). this all in a loop! In my 8266 scatch i additionally sniff the SSID..wondering if ESP32 also will be able to get the SSID!? now i will digg deeper into your code and bring it hopefully to fly like ESP8266 (promiscuous + Station ). Hi, thanks for sharing the code! 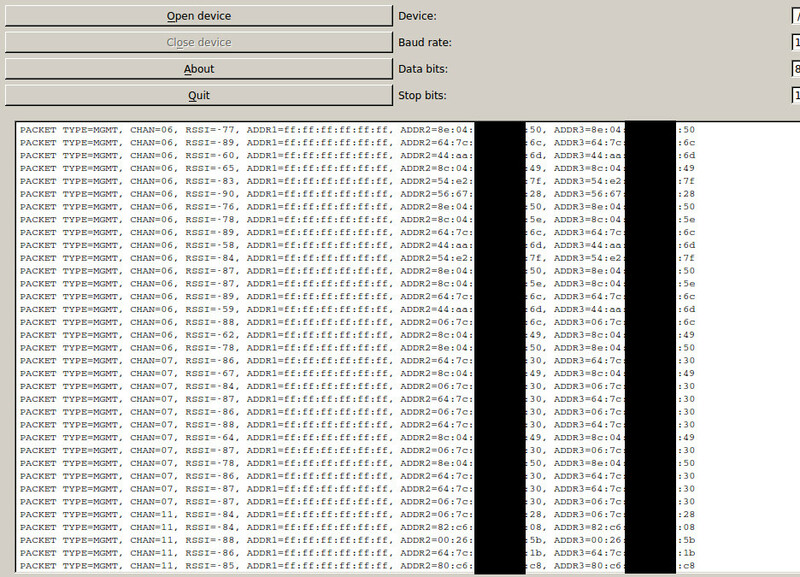 I’m sure you can find all visible acesspoints by capturing their prob req/resp packets containing all that info, i.e. SSID/BSSID. It works like a charm, but a change needs to be done in order to compile correctly. shoud be commented or removed, because the type WIFI_PKT_CTRL is not included in esp_wifi_types.h and this kind of packets don’t have any interesting meaning. You’re welcome! 🙂 Thanks for reply on that. Good hint. I need to verify it again as esp-idf is constantly maintained what is so amazing. I tried your code with latest esp-idf (mid August) but it captures only management packets. No way to sniff data packets at all! Do you know the reason? It captures management packets due to if-condition inside the function. It imply other packets are just dropped. If you remove that condition then it should capture other packets as well. Have you actually tried to build this and test it? Doesn’t promiscuous mode require the device to be already connected to a network? 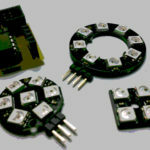 Why should promiscuous mode need to be connected to a network? Have you read what promicuous mode is and what is it for? 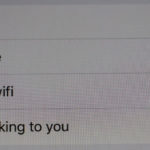 Where do you set the ssid and the password of the network? I mean, how does the esp32 know, ‘where’ he has to capture the network traffic? You don’t need to set SSID/password after its been turned into promiscuous mode. This mode allows you to capture all packets from the current WiFi channel of ESP32 module. I try your demo,but it shows fail. Could you provide more info ? AVR development board for ATtiny13, ATtiny85, etc.